This dish is the perfect healthy mid week meal. Hake, cod and haddock can all be used instead of whiting. Preheat the oven to 200oC/gas mark 6. Place all the chopped vegetables in a large bowl. Add 50ml of the oil and season with salt and pepper. Mix well, then transfer to a baking tray and spread the veg out in a single layer. Cook in the oven for 30 minutes. Place the whiting in a bowl and mix with 50ml of the olive oil and the fajita or cajun seasoning, tossing well to evenly coat the fish in the oil and spices. Place on a baking tray and cook in the oven for 15 minutes. Place the couscous in a large bowl. Add the remaining 50ml of oil and the lemon juice. Pour over 200ml of boiling water and mix together, then cover tightly with cling film and leave for 6 to 7 minutes. Remove the roast vegetables from the oven and stir them into the cooked couscous with the chopped parsley. Season to taste with salt and pepper. 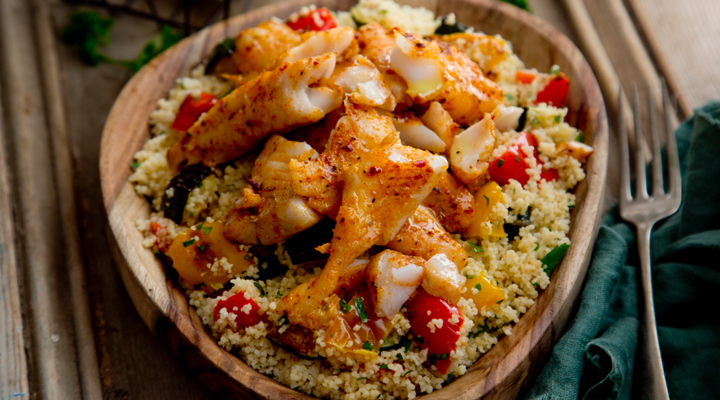 Serve the couscous on a plate topped with of the spicy whiting and a final drizzle of olive oil. Tip: You could also use hake, cod or haddock instead of whiting.